For Whom the Bell Tolls begins and ends in a pine-scented forest, somewhere in Spain. The year is 1937 and the Spanish Civil War is in full swing. Robert Jordan, a demolitions expert attached to the International Brigades, lies "flat on the brown, pine-needled floor of the forest, his chin on his folded arms, and high overhead the wind blew in the tops of the pine trees." The sylvan setting, however, is at sharp odds with the reason Jordan is there: he has come to blow up a bridge on behalf of the antifascist guerrilla forces. He hopes he'll be able to rely on their local leader, Pablo, to help carry out the mission, but upon meeting him, Jordan has his doubts: "I don't like that sadness, he thought. That sadness is bad. That's the sadness they get before they quit or before they betray. That is the sadness that comes before the sell-out." For Pablo, it seems, has had enough of the war. He has amassed for himself a small herd of horses and wants only to stay quietly in the hills and attract as little attention as possible. Jordan's arrival--and his mission--have seriously alarmed him. "I am tired of being hunted. Here we are all right. Now if you blow a bridge here, we will be hunted. If they know we are here and hunt for us with planes, they will find us. If they send Moors to hunt us out, they will find us and we must go. I am tired of all this. You hear?" He turned to Robert Jordan. "What right have you, a foreigner, to come to me and tell me what I must do?" In one short chapter Hemingway lays out the blueprint for what is to come: Jordan's sense of duty versus Pablo's dangerous self-interest and weariness with the war. Complicating matters even more are two members of the guerrilla leader's small band: his "woman" Pilar, and Maria, a young woman whom Pablo rescued from a Republican prison train. Unlike her man, Pilar is still fiercely devoted to the cause and as Pablo's loyalty wanes, she becomes the moral center of the group. Soon Jordan finds himself caught between the two, even as his own resolve is tested by his growing feelings for Maria. Note that this review is for the audio book version of this novel. The narrator was Campell Scott. The audio quality was excellent and the narrator did a good job; he spoke with a slight Spanish accent, which seemed to fit well with the narrative. He did some characterizations with his voice, but not much compared to other narrators I've listened to. This is the second time that I have read this novel; the first time was over 30 years ago in high school. It's amazing to me how differently I looked at this book this time around. The first time I read it; I saw it as an adventure story with some interesting character development. The second time around I read it as a fascinating look at how war brings out the best and worst in people. I feel that Hemingway accurately captured how certain people would act in a civil war; the cruelty by some and acts of courage by others. In all cases, the characters were in a situation where there were no great options. He also accurately showed that there are good people on both sides of a conflict; that soldiers do suffer by taking the lives of others. As a Spanish speaker; I enjoyed Hemingway's use of language. Most of the unique use of English is actually a direct literal translation of Spanish. I hadn't heard the phrases directly translated that way before, but immediately recognized them as common Spanish slang. This tackles several questions: How war shapes men, past and present and what a real hero is. Set in the Spanish Civil War, the story revolves around the experiences of a volunteer fighter, an American college professor named Robert Jordan. Filled with idealism at first, watch him reconsider as he faces the prospect of his own death. As a huge fan of The Old Man and the Sea, I was very excited about reading this novel. I was therfore surprised to find that parts of this book I struggled through and found slow moving. In particular, the love story between Robert and Maria did nothing to move me, finding Maria not so much the tragic heroin, but a woman so obsessed with the happiness of her lover that her personality is lossed in a need to please. So much so for me, that I found it difficult to understand why Robert would fall so madly in love with her. Characters such as Pilar who show a more outspoken independence were more appealing to me. Pilar's description of the revolution of the small town coordinated by Pablo was a magic moment in the book. This narrative was the kind of writing I was expecting and was dissapointed that this was for me the highest part of the book, and so early in the novel. Filled with complex and interesting characters and written in Hemingway's characteristically simple, but effective style, For Whom the Bell Tolls is Hemingway at his best. There are few novels I would recommend more highly. Hemingway's fascinating characters, from the American, Robert Jordan, to Pablo and Pilar, often referred to "the woman of Pablo" (if there can be one criticism of Hemingway, it is that his female characters are often simple; however, this is not true of Pilar), make this novel so wonderful, along with Hemingway's vivid descriptions of everything from the characters themselves to the horrors of war (one scene that comes to mind particularly is Hemingway's description of the execution of a group of fascists, who are beaten to death before being hurled from a cliff). Hemingway published FOR WHOM THE BELL TOLLS in 1940, just after the end of the Spanish Civil War. Surely, one of Hem's goals in writing this novel was to capture in fiction the full human and political complexity of this war, which was, for a time, the great international cause. This may explain why this novel, despite its great craftsmanship and virtuosity, reads a little long. Hem, you see, had to get everything in. IMHO, the best feature of this terrific book is its wonderful Spanish characters. These participate in the war, which is a great cause for Robert Jordan, the novel's protagonist. But they participate because of family loyalty, fascist war crimes, or class rage and soldiering is mostly peripheral to their personalities. What the reader remembers is not their support of the Republic but the integrity of Anselmo, the dignity of Fernando, the humor of Agustin, the simple loving sincerity of Maria, the harsh surface of Pilar, and the murderous treachery of Pablo. These are, basically, ordinary Spaniards caught in a gruesome tragedy, not ideologues or idealists who are transformed or energized by the cause. Hem also handles Robert Jordan skillfully. When Jordan first appears, he seems to be concerned only with his duty to the cause, which, on this mission, is to blow up a bridge. But quickly, Jordan meets the loving Maria. Then, through this relationship, Hem explores Jordan's thoughts and feelings on life and death. While Jordan is not an extraordinary man with breakthrough thoughts, he is an extraordinary character who, thanks to Maria, both examines the rationale for risking his life and identifies the beauty of what may be its final few days. There are many great scenes in this novel. Among my favorites are the appearance of the planes and Pilar, at fireside, telling the story of her matador lover. And--surprise!--Hemingway is funny in FWTBT, not in a hilarious Robin Williams style, but with the dexterity of a witty companion. With Hemingway's misogyny, competitiveness, alcoholism, and depression now raised to critical prominence, I was surprised to see that the man could be a good guy. FWTBT is number 74 on the Modern Library's list of 100 Best Novels... a bit low in my estimation. For Whom the Bell Tolls (FWTBT), a masterpiece no doubt, combined with the superb reading of Campbell Scott, exceeds any book I have ever heard on Audio. Though judging it only in terms of the audio book, it compares with no fiction I have ever heard or read, and I have read and heard a lot. There are a few books that I have encountered that merited a second read or in this case listen, the Bible being one. But after listening to FWTBT, I went and purchased a book about the Spanish Civil War, read it and then listened to FWTBT again, now understanding some of the context and players better. It was even more rewarding the second time. I am by no means saying you must first know something about that war to enjoy this book. You don't. But the read is improved in the same way an exquisite wine or cigar is improved with age. In summary, an awesome work, such as I have never experienced. The Master (Hemingway) read by a master in his own right (Scott). It is a fascinating tale of Robert (Roberto) Jordon and his paisonos, caught up in the Spanish Civil War. The story covers only three days of the war, yet it takes us on Robert Jordon's life voyage. It is conveyed by the brilliant soliloquy, a tug of war of conscience, duty, honor and death itself. Who among us has not had such dialogue? It has everything, romance, camaraderie, bravery, cowardice, and above all sacrifice. Jordon, an American, who is addressed as "Ingles" by his comrades, is the band's leader, who is commissioned by the rebellion general to blow up a bridge. His team includes some unforgettable characters ever penned, the ruthless yet pragmatic Pablo, his incredibly humane wife, Pilar, Augustine, brave soldier, like a brother to Robert, and lovely, innocent Maria. Roberto (Jordon) and Maria fall in love the moment they meet and once Pilar reads his palm, the denouement is never in doubt. The scene where Pablo is in charge with a gun hustling out town's fascists who are holed up in the church, to be "taken care" of by the avenging mob outside is reminiscent of "krystalnacht" enactment superbly portrayed by G¨¹nter Grass in his classic Nazi drama" Tin Drum". Robert Jordan, an American in at least the third generation, and a teacher of Spanish from Montana, goes to fight in the Spanish Civil War. His motives are never discussed, as are not the theater of or the reasons for the war. The novel is rather about several people who, in the course of a few days, are helping Robert Jordan complete his mission: to blow up a bridge. The novel's tall order - being "involved in Mankinde" to the extent of fighting thy neighbor's civil wars - is echoed in the story's close engagement with each character. Here is the natural-born killer Pablo, his no-nonsense and wise Gypsy wife Pilar, the beautiful young girl Maria who is carrying much pain, the good old rock of a man Anselmo, who fights to win this war, but who in his bones knows that thou shalt not kill. Robert Jordan is singled out to have both the first and last name. All the other foreigners go by their last names and the Spaniards - by their first ones. Besides embodying the foreign engagement in the Spanish affair, Robert Jordan also brings a distinctly human element into the war zone: the lonely human name among the nomes de guerre of general Golzs and partisan Anselmos. I began reading For Whom The Bell Tolls directly after finishing a particularly bad modern novel. At first, For Whom... was a breath of fresh air: no long, run-on sentences; no excessive adverbs in the dialog tags; not a whole lot of meaningless adjectives, etc. The dialog was crisp and terse and enjoyable, and the setting was captivating. But then... nothing happens. For a really long time. And all of the flashbacks via thought and story start to get confusing. At times, I wasn't sure if the story was in the present or past; in the thoughts of the protagonist or the speech of another character. And speaking of characters, four of them are strong and compelling: Robert Jordan (the protagonist), Maria (his love interest), Pilar (a tough old woman), and Pablo (a once-great but now tarnished soldier). A fifth character of note is the Gypsy, but the other characters in this ensemble cast are largely indistinguishable from one another. One more criticism: I was really hoping to get a better understanding of the Spanish Civil War and its politics. Maybe I did. But Robert Jordan and his cadre are not hardline Communists nor anarchists (they have special contempt for the latter) but "republicans" in their fight against the Fascists. Not a lot of background is given as to the roots of this conflict or the underlying motivations of each camp. I'm a middle-aged middle-class guy. 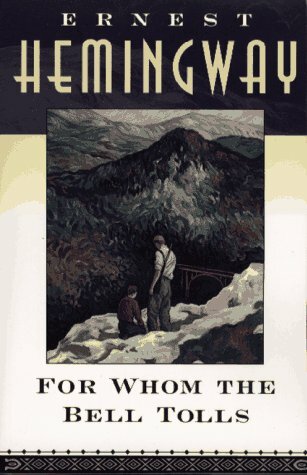 I read this recently, since it has a reputation as one of the great Amerian novels, and my particular HS required no Hemingway. I figured the time had come. This way we get to study two different couples. We learn that Pablo and Pilar, the guerillas, have killed many people, up-close and personal. Pablo seems to have enjoyed it. Pilar did less hands-on killing but she and the others are still dedicated to the cause. Now here comes an outsider, a handsome young American with no real dog in this fight, bringing the front closer just when Pablo has had enough. Even worse, he falls for Maria, and sleeps with her in his own bag, outside the cave. (The love scenes, though not very graphic, are pretty juicy for their time.) Pilar tries to bolster Robert's resolve, even plotting against her husband. Maria is lost without Robert, and will follow him anywhere. But where will Robert end up going? He has committed himself, and he wants to fulfill his duty as a matter of honor. What destiny will bring the best honor for both himself and Maria? Having sacrificed so much so far, what further sacrifice do any of these people need to maintain their honor? It's difficult to point at one work of a writer like Ernest Hemingway and claim it to be the best, but that is the claim that I would make for "For Whom the Bell Tolls." This is a story that captures both the true spirit and the doubtful minds of war. It portrays both courage and cowardice, in the beautifully descriptive words that Hemingway was known for. His main character Robert Jordan is an American college instructor who leaves his job to take part in the Spanish Revolution, with a strong conviction in his heart and truly believing that he can make a difference. The story encompasses a time frame of slightly less than three days, during which he plots to blow a strategic bridge at precisely the right time. In those three days he falls in love with a young Spanish girl in the encampment where he is awaiting that moment and is involved in a character conflict with one of the guerrilla fighters by the name of Pablo. This is a well paced story and never boring, with action suspense and romance, all coming together in a setting where you can feel the cold and smell the forest in the way that only Hemingway can describe it. A splendid and beautifully told story that I would recommend to anyone of any age or gender. For that reason I would place "For Whom the Bell Tolls" at the top of the heap among all of his works. In my opinion this great story is the pinnacle of Hemingway's talent. A must read for anyone interested in great literature. This is my third experience with Hemingway, and while I fully expect to complete the entire Hemingway collection, I can't quite find it within myself to award five stars to any of the works I've read to date. In each of the novels (The Sun Also Rises and Farewell to Arms being the other two) I've been entranced at times by the hauntingly beautiful writing, however there have been periods where the story drags, where the almost stream of consciousness style grinds the action to a halt. Not long enough to kill the story, but enough to impact the overall reading experience. This novel is set in Spain, during the Spanish Civil War, the idealogical precursor to the Fascist/Communist clash soon to come on the Eastern Front of World War II. The story primarily involves American Spanish professor and converted Republican partisan, Robert Jordan and the 72 hours he spends with an anti-fascist partisan force in the hours preceding a Republican offensive. The characters crafted by Hemingway are fascinating, most specifically the partisan leaders Pablo and Pilar. The interaction between the rebels and with Jordan are spellbinding. The character of Pilar is especially haunting and her story of the execution of the fascists (a/k/a prominent citizens) in her small Spanish village is some of the best and most captivating writing I've ever read. Unfortunately, in my opinion, this 470 page novel is about 100 pages too long, as it is interspersed with periods of inaction, punctuated by stream of consciousness meanderings, which admittedly many may find enjoyable. Some may find the style of language irritating (Thee, Thou, Thy mother, etc.) but I found this to be a minor issue. More problematic to me is what I can only guess is the censorship (either self censorship in light of the times or editorial censorship) whereby all instances of profanity or coarse language is omitted and replaced by bizarre alternatives. For example, these beauties from the mouth of Pablo, "I obscenity in the milk of all," and "Go and obscenity thyself." I find it hard to believe that Hemingway actually wrote this, and if not (or even if he did), these bizarre omissions cannot be rectified. "For Whom the Bell Tolls" starts out simply enough, but it slowly progresses to being a book that houses a series of complex, not entirely predictable characters. Robert Jordan is the main character, an American, often comparing, often thinking. We follow him around in the midst of a not-so-pleasant, frighteningly bloody war. He is accompanied by other men who are either helping him, or have similar tasks, though not all are so. There is Pablo, who in reality, is Jordan's enemy, in that he intends to prevent Jordan from blowing up a certain bridge. There is Pablo's wife, Pilar, who tells a chunk of the book in the form of stories to Jordan about the past. There is Maria, Jordan's crush, and though many concentrate on their love, Maria is a rather flat character, though her history is one that tells more about the surrounding situation. The book itself isn't across that long of a time span, on the other hand it includes many stories that are told to Jordan. The reader is drawn in quickly, and despite the blood, the fear, and the uneasy way everything is written, it's an incredible book. Perhaps it's because of these things; they make the book more realistic and touching to the reader. The book arrived in perfect conditions and in the date it was said to arrive. Thank you for your attention! This is one of several Hemingway books I have come to read, actually in this case, listen to. I loathe idling about so I decided while I wait, wherever that maybe, I would listen to an audiobook. I prefer the unabridged versions which in this case was quite long. I found the subject matter mysteriously complex ( who doesn't find love complex ) yet simplistic in it's exposition true to Hemingway's style. Each character is carefully developed and his/her relationships meticulously crafted and consistent with their dispositions. Hemingway explores humanity and allows us a glimpse of it in the most trying circumstances....love and war. It really is very hard to discuss the book without ruining details and the outcome so I will stop here. "War is not a life: it is a situation, one which may neither be ignored nor accepted." Published in 1940, this is a story about a young American man (Robert Jordan) who is in the International Brigades and attached to an anti-fascist unit during the Spanish Civil War (1936-1939). Jordan is an expert w/ explosives, and his mission is to blow up a bridge during an attack of the city of Segovia. Most of the novel is told to us from Jordan's perspective, which is obviously motivated by Hemingway's own experiences while living in Spain during this violent, chaotic era. The story is essentially about the three days leading up to Jordan's mission and takes place in the mountains just north of the capital of Madrid. It is here, that he meets a truly unforgettable, colorful cast of characters - Maria, Anselmo, Pablo, Pilar, Fernando, El Sordo, Agustin, Rafael, et al..., all fighting the good fight with our hero Senor Jordan. Jordan, like most of Hemingway's male protagonists, is full of testosterone, a bit aloof and apathetic, disillusioned, and of course, heroic. Papa Ernie describes him further, early on in the novel: "He was serving in a war and he gave absolute loyalty and as complete a performance as he could give while he was serving. But nobody owned his mind, nor his faculties for seeing and hearing, and if he were going to form judgments he would form them afterwards." Like Ernest himself, Robert is a rough and tough, cynical, macho man. However on the flip-side of that coin, he is also a very sensitive and vulnerable soul, a flawed, complex character full of contradictions. He is a realist and a dreamer. He is a passionate lover and a fighter/soldier, a trusted, loyal friend and a bitter, vengeful enemy, etc... In other words, one big ball of paradox! Many reviewers have criticized Hemingway's characters for being too simple and unsophisticated. For example, the beautiful Maria, Jordan's love, especially takes a beating, for being so shallow and two-dimensional. However, I don't agree with that assessment at all. We have to remember that she is a simple, country girl who has been brutally treated by the enemy (I will not disclose how) and is caught up in trying to survive the savagery of a war. What do expect her to be like - Isabel Archer? Emma Bovary? Yes, Maria is a bit too simple and submissive for most strong, modern-day women to relate with. But Hemingway's creation of Pilar, well, there is a dame of different colors completely! She is one of the most fascinating and also one of the funniest creations in all of literature - a truly singular and intriguing character indeed! This was quite a nice surprise for me. I have only read five of Hemingway's pieces, yet this one is not only my favorite, but also has enticed me to pick up a few more of his classic works. It is the type of book that you either are going to love or going to hate and you will know which side of the fence you will fall on right from the get-go. Hemingway was a true minimalist, and spins this heart-pounding, intense yarn in a simple, straightforward manner. He doesn't develop his characters a la Austen, Balzac, Tolstoy, James, et al... but yet, few authors can do so much with so little like old Ernie could. And this classic is a prime example! Fiercely and austerely told, it is one hec of an intense ride! Hemingway deftly walks us into the heart of war and a man caught between his loyalty to his position in the military and his love for Pilar, a woman like no other. Some highly memorable scenes and conflicts prove this novel's place as a classic. If you read only one, perhaps this should be it. I am not a trained student of Hemingway, or of literature for that matter. I know what I like, and I can recognize junk. You don't have to be an expert or even fully understand the author and his times to appreciate what a superb novel this is. As I was reading it, I could realize why Hemingway was so honored, even during his lifetime. The story is basic, though the setting is in unsual one for most American readers (who today probably would guess that the "Spanish Civil War" has something to do with General Lee and the Alamo). The main character, Robert Jordan, is an American leftist attached to a guerilla unit in the Spanish mountains. Like Hemingway, Jordan is intelligent, deliberate, controlled, passionate, and motivated by his ideals. Through him the reader encounters the chaos of this amateur war that is being played by foreign professionals. The entire book, which is of some size, revolves around one mission and take places over only a couple of days. In addition to a political statement and a philosophical autobiography, this is a superb war novel. The book build up the mission (to destroy a bridge) so much that by the closing pages of the book, as the mission is unfolding, my heart was literally racing and I could not put the book down. I won't spoil it - but this one ends like so may of EH's books, and like EH thought life itself would end . . . . I disagree with the reviewers that bash the literal Spanish translation (I actually kind of enjoyed it for the most part), but I also agree fully with those who say that parts (loooong parts) of this book are slow. Really slow. I'm also with those who are annoyed by the constant use of Robert Jordan's full name. He's the only "Robert" or "Jordan" in the book, so why can't Hemingway just pick one and stick with it? An abridged version (taking out half of the flashbacks) would have kept up the pace of the story better, and at 300 pages or so this would have been a much more enjoyable read. I finished the whole thing (500 pages) in about 3 days, but I'll admit to skimming through many of the flashbacks (the obvious exception being Pilar's flashback about Pablo killing the Fascists). For Whom the Bell Tolls is quite simply one of the best novels ever written. Honestly, I had relatively low expectations before reading it. I read A Farewell to Arms and found the terse, repetitive prose and stilted dialogue underwhelming. For Whom the Bell Tolls is superior to A Farewell to Arms in every way. This is a complex novel with some of the most memorable characters in modern literature. This mesmerizing novel neither glorifies war, not does it vilify it. Hemmingway's detached prose is world weary, exposing both sides of the conflict, allowing us to see that war, inevitable and futile, is never simple. Characters on both sides of the conflict struggle with their own fears and regrets. Both sides commit, and are subjected to, the atrocities and horrors of war. As different as each side may think they are from the other, in the end, they are all human and are not as different as they think. For Whom the Bell Tolls is riveting and powerful, easily one of the ten best novels of the 20th century. I can't recommend this book highly enough.